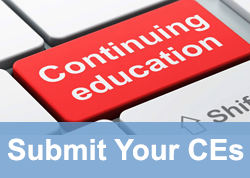 Please log into your My NEHA account to submit Continuing Education (CE) credits. Below are instructions of how to enter your CEs. NEHA is currently working with our database administrator in order to have your CE history reflected in your My NEHA account. We thank you for your patience during this transition, and we hope that you enjoy our new system and all of the ways it helps us better serve you, the environmental health community. 1. Log into your My NEHA account. 2. On the right side of the screen, look for "My Credentials and CEs". Then click on "Report CE Credits". 3. Enter in the required information. Credit Type should always be "CE". "Date Attended" is the date in which you attended the course, training, conference, etc. 4. Click "Create" in order to submit your hours. You will then be brought to your CE Credit History. Please note that NEHA is still working with our database administrator in order to ensure that all the information on that screen is correct. The information on this screen will most likely change in the next month and be updated with all of your hours. We appreciate your patience during this update.